This Classic Fruit Tart is the type you’ll encounter in just about every French bakery case. A sweet shell, filled with pastry cream and topped with lots of berries, they are always eye-catching and so tempting. But they are really so easy to make at home, and very often, much tastier. Made at home, you can control when you assemble it, so the shell stays crisp and the berries fresh and vibrant. You can even play around with the flavors. I took the regular vanilla pastry cream and added a bit of almond extract to it, too, because I like that flavor with berries. 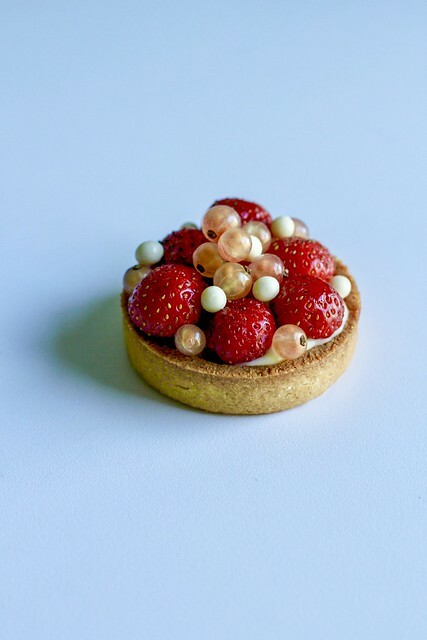 I made mini tarts just so I can fill them as we want them, since there are only two of us. I couldn’t fit that many different fruits on top of my mini tartlets…space was a little restricted. I went with teensy tristar strawberries and some pink champagne currents. Then I filled in the gaps with some white chocolate Valrhona crunchy pearls. Maybe tomorrow’s pair will have raspberries in place of the strawberries, or maybe even rhubarb compote. Options, options. Cute as a button tarts. I have not heard of champagne currents, champagne grapes yes but not currents. Looks wonderful and you are right the options are endless. This tart is so cute. The currants and the pearly white chocolate crunch take it over the top! wow wow wow this is gorgeous!! Where do you get the pink champagne currants? what do they taste like? thanks! one guy at my farmers market had the champagne currants and they were so pretty, i couldn’t resist. they are tart like a red currant but are a nice pop with other sweet stuff. 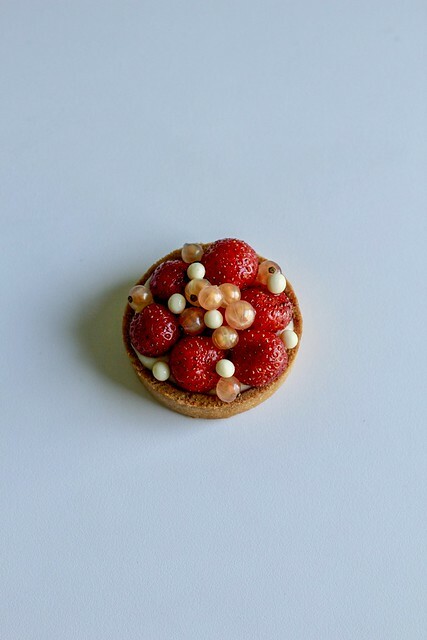 Your little tart looks so beautiful! The pearls are devine. I’ve never seen pink champagne currents…they’re so pretty. Seriously looks like something in a magazine! Gorgeous!! I love the addition of the currants and chocolate…makes it unique and oh so pretty! Love the play of the pearls and the currants. So beautiful!